In this two part series, we'll look at how to properly establish perennials on your property that will benefit wild turkeys along with other wildlife! If you manage your property for wild turkeys, whether your goal is attraction during the spring hunting season or nutrition for the entire flock, a perennial clover blend needs to be on your food plot “menu.” For those in northern states I consider it to be the “cornerstone” of a sound food plot program for both turkeys and whitetails. Those in the south may also plant clovers, but the cooler, humid growing season in the north favors these legumes. Different varieties are chosen for a range of characteristics to meet specific management goals. Regardless of your goals a perennial clover blend needs to be in your program because of its wide range of payback to wild turkeys as well as other species. White clover is a perennial legume that can provide years of quality, high protein, extremely attractive forage. Red clovers tend to be a bit easier to grow in a wider range of conditions; however, they are typically not as attractive to birds or beasts as most white varieties. The best product for most food plot farmers will be a “blend” of several different clover varieties and other perennials like alfalfa, chicory or birdsfoot trefoil. With a “blend” you not only supply your property with a wider array of choices and provide an attractive option for longer than a single variety, but you also protect yourself against failure due to specific growing conditions unfavorable to certain cultivars. As it is when planting anything, moisture is the key determinant for success when planting clover. As long as you receive 30 inches of rainfall annually you should be able to find perennials that will work for you. In drier or sandy areas adding deep-rooted perennials like alfalfa and chicory to the blend will help dramatically in stand survival. When maintained properly and planted in soil which is initially close to a neutral pH, perennial clover blends can produce for six to eight years or more. In more acidic soils because of the need to incorporate lime when the soil reverts back to being too acidic, depending on your soil type and original pH you can expect more like three to five years from your crop and then you’ll need to incorporate lime again. When managed correctly, white clovers will spread by sending out a stem that grows horizontally along the ground surface called a stolon. The stolon will create nodes (a joint on a plant stem where a leaf attaches) where roots will form. This process creates “daughter plants” which will replace the original seedlings after a few years. So persistence is the best in the varieties that create the most stolons, which tend to be the small-leaf white clovers favored by turkeys. Renewal from seed is also possible. If the plants are not browsed heavily or mowed often they will flower and produce seed. Regeneration from seed helps longevity in areas with dry summer conditions. Large-leaved types (like Ladino) perform best when they are mowed less frequently, or when browsing pressure is limited and plants are allowed to mature. Still mowing is important, especially during the cooler times of the growing season. On the other hand, the small-leaved types respond better to frequent browsing and/or mowing. Large-leaved varieties grow taller and stand upright more than the small-leaved types. Small-leaved varieties typically have thick stolons and strong roots. Large-leaved types have fewer stolons and usually don’t regenerate or persist as long as medium and small-leaved white clovers. Medium-leaved types (like White Dutch) are, as you’ve probably guessed, intermediate in features; these perform well under a wider range of situations. Constant browse pressure is tolerated best by the small-leaved types. As said, small-leaved types do not grow as tall as the larger-leaved clovers, but they have numerous small leaves and many stolons so they are an excellent choice for areas that receive heavy browse pressure. Given the different management necessities of the numerous varieties, before choosing which type of clover to plant, think about your growing conditions, your deer density in relation to the amount of acreage you will provide in clover and what you will be able to do for a maintenance routine (how often you will be able to mow, spray with herbicides, over-seed, etc.). Yes, that’s right, I said “deer density” and we’re talking about turkeys, but if you also have deer (whitetails or mule deer) they will consume much more than your birds will so you need to consider this. As an example, if you don’t have the resources to mow the plot frequently, especially during the spring when clover grows rapidly, or if the browse pressure is low in relation to the amount of acreage devoted, then a large-leaved form may be preferred. On the other hand, if you have the ability to mow the stand frequently during the spring and/or the deer density is high relative to the amount of forage, then a small-leaved type of clover would be preferable. The (small-leaved) types of clover perform best when the stolons are exposed to sunlight – which encourages daughter plant production at the nodes. This response ensures the stand is thick and new plants are constantly being produced. This will help to ensure the stand remains productive for many years. Again, for most people a “blend” of different varieties of both, red and white clover possibly combined with chicory and/or alfalfa will be the best selection. The specific growing/management conditions will bring the cultivars that favor those conditions to the forefront. One important consideration to note is that large-leaved clover doesn’t mean more tonnage per acre. The yield of most white clover types (large-leaved through to small-leaved) is comparable if each variety is cared for properly. I suggest that your total perennial acreage be planted in stages so that it is not all the same age. If you replant, remember that it means the field will not provide a good source of food for almost an entire hunting season. Ground preparation and planting combined with waiting for germination and the time required to produce enough growth requires so much time that replanting is equivalent to “cleaning the refrigerator” and asking your “guests” to dine at a different “restaurant.” By planting in stages you never eliminate all of your perennials at once. For more information on Biologic seed, including their Clover Plus, Perfect Plot, and Sudden Impact perennial blends, be sure to visit www.plantbiologic.com! In our next installment, we'll discuss proper planting techniques and more! Todd Amenrud is currently the Editor in Chief for GameKeepers-Farming for Wildlife magazine. In addition he writes columns in over 60 outdoor and general circulation publications as well as taking on numerous assignments each year for several larger outdoor magazines. 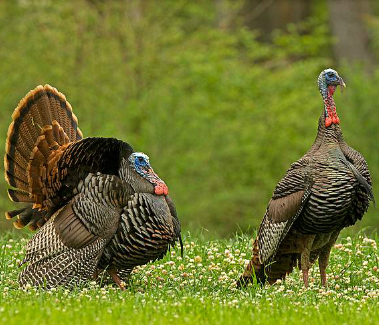 A noted authority on both whitetails and wild turkeys, he conducts over 80 seminars annually.